Thursday was my last cake class & for the final I had to make a wedding cake. To stay true to my procrastinating ways, I waited until the night before to even come up with a plan as to what style I was going to make. I wanted something simple, but not traditional. Something that I would enjoy looking at every time I open my refrigerator for the next week, as this cake slowly gets eaten away (by my boyfriend, NOT me--haha). Don't get me wrong, the cake is fantastic, but I don't need my daily intake of food to consist of cake!! It is super delicious though! Here is the final product. Not too shabby considering I've never done anything like this before. The cake is chocolate, with a chocolate espresso frosting. It is covered in fondant, which I didn't make but it is vegetarian. However, I did color the fondant myself which was a whole process in itself. The brown color used up a LOT of coloring to get the shade I wanted. 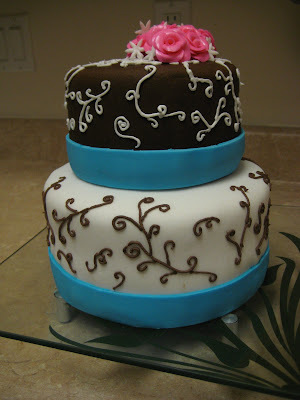 Fondant is a lot like molding clay, and it is what I used to make the flowers as well. I've tried making roses with frosting and they usually look horrible. 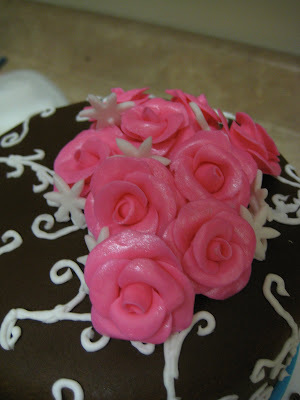 So I decided to whip up hot pink fondant and mold the roses by hand, and then painted them with edible glitter.